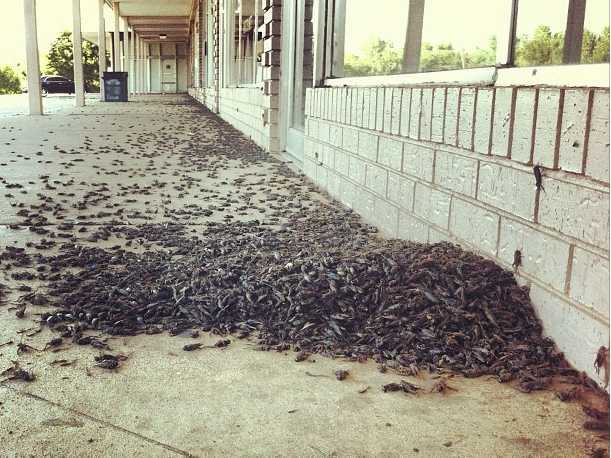 During the months of August and September of 2013, the state of Oklahoma underwent a cricket attack of Biblical proportions. After a mild winter and an uncommonly wet spring and summer, Oklahoma has been plagued with hordes of the insect from the central to northeastern parts of the state. Although having a cloud of insects around your home can be a nuisance, Dr. Grantham states that having crickets “attack” is not necessarily the worst thing to experience, as they provide food for birds and other animals that prey on them. The state of Oklahoma seems to have recovered from their condition of shock after seeing the clouds of incoming crickets charging toward their homes, and Dr. Grantham assures everyone that something like this only happens “once every five to ten years.” So, for those shoveling piles of the dead insect away from the side of their home or school, just know you will all will get to wait at least half a decade before you have to do that again. As for now, relax and know that a cricket plague has come and gone, and we are all still here.